For all our loves and kinsfolk, living and even dead, for all the different things that comprise the measures we use in the accounting of this thing we call our life, we give thanks. For all new life, new people, new vigor that has come to us this year, we give our thanks. For all those things that we have built this year, and all the things we continued to build, having started previously, we give our thanks. For anything that we have cultivated, nurtured, and produced that is necessary, useful, uplifting, or beautiful, we give our thanks. For the health, ability, and privilege we require to build anew, to continue construction, and to produce anything at all, we most emphatically give our thanks. For anything that has, entirely outside of our control, been given to us this year by others or from above, we give our thanks. For all our luck and good fortune, we give our thanks. For any ability we have to recognize injustice, to refuse to accept things as they are, to perceive that which is malevolent, villainous, and oppositional, we give our thanks. If we have had the supreme good fortune to actually fight any of these things, we really give effusive thanks. For a sun that still burns, but not too hot, for a planet that still spins right, for an earth that still – for now, today – sustains our continued existence as a conscious species, we say, at the very least, our thanks. For the pleasure of having completed 2014 and the joy of surviving to see another one, we give our thanks. 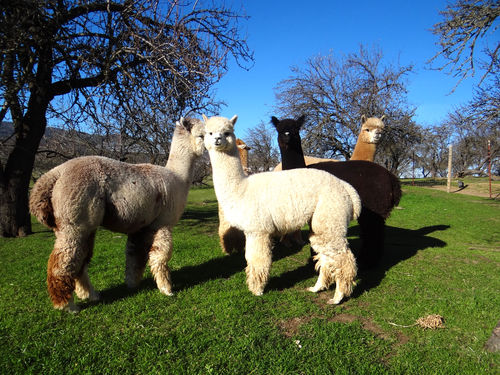 And may smiling alpacas be waiting to greet us all at the end of all of our journeys.